This article was last updated Apr 02, 2019, but some terms and conditions may have changed or are no longer available. For the most accurate and up to date information please consult the terms and conditions found on the issuer website. A great perk that comes with The Platinum Card® from American Express is entry into one of the most comprehensive networks of airport lounges in the world. These lounges not only give you respite from the crowds, they allow you to decompress, enjoy a meal or a cocktail and get help in case there are issues with your flight. We look at why The Platinum Card® from American Express more than pays for its $550 annual fee with its lounge network alone. We’ll also look at the card’s other travel perks that make it even more valuable for road warriors. Carrying The Platinum Card® from American Express gives cardmembers access to five lounge networks. The first is American Express’s own Centurion® Lounges, with locations in Dallas/Fort Worth, Hong Kong, Houston, Las Vegas, New York-La Guardia, Philadelphia, Miami, San Francisco and Seattle, with new lounges slated to open in Denver, New York-JFK, Los Angeles, London-Heathrow and Charlotte, N.C. There are also 10 International American Express lounges, including Stockholm and Delhi. Cardmembers can bring two guests into the lounges for free. However, on March 22, 2019, American Express tightened up Centurion Lounge access as demand has grown. Since the Centurion Lounge is a day-of-departure lounge, cardmembers arriving after a flight has landed will no longer be admitted. But, the lounge will, however, admit cardmembers with connecting flights or layovers, but passengers’ whose flights are more than three hours before their departure time will be denied entry. Next are Delta Air Lines’ Sky Club® lounges. The Platinum Card® from American Express members have free access to more than 50 lounges when flying on a same-day Delta ticket and can bring in two guests for $29 each. Then there is Priority Pass Select, which gives cardmembers entry into more than 1,200 lounges around the world. Additional guests cost $27 each. There’s also the six North American and five U.K.-based Escape Lounges for cardmembers and up to two guests. And finally, there is the Airspace Lounges in Cleveland and San Diego, for cardmembers and up to two guests. Tip: Use this searchable directory of clubs accessible to The Platinum Card® from American Express cardmembers before every trip. Also find lounges at the membership section of the American Express® App or Text FINDALOUNGE to 86509 for a link to download the app. You must present The Platinum Card® from American Express at the lounge check-in desk, along with your boarding pass for travel that day. The lounge doesn’t require you to be flying on a specific airline to qualify for entry. A spouse or family member can’t get in if they’re not traveling with the cardmember. Tip: Cardmembers can add a spouse or family member as an additional cardholder so they have lounge access even when they travel separately. It costs $175 a year for up to three cards and $175 for each card after that. But if your companion travels solo regularly, it may be a good investment. Help with travel itineraries, future travel, card inquiries, restaurant reservations and other requests. Food developed in partnership with renowned local chefs. Signature cocktails, premium spirits and curated wines. Tip: If your chosen lounge is full, use the card’s Priority Pass Select lounge benefit and get $28 toward the cost of a meal, drink or stay at participating airport partners. 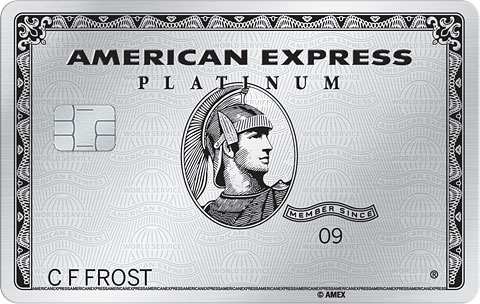 What else does The Platinum Card® from American Express offer? While lounge access is one of the biggest attractions of The Platinum Card® from American Express, other perks that ease the hassle of traveling also makes it worth the $550 annual fee. A yearly $200 airline credit to cover fees, including checked bags and in-flight refreshments. Up to $200 yearly in Uber credit. Gold status with the Marriott Bonvoy™ and Hilton Honors loyalty programs. Special benefits after enrolling in Avis® Preferred Club, Hertz Gold Plus Rewards and National Emerald Club Executive loyalty programs. Free Wi-Fi access at Boingo hotspots worldwide. Access to the Fine Hotels & Resorts program. Extra perks when booking rooms at The Hotel Collection. Reimbursement for Global Entry or TSA Precheck enrollment fees. The ability to transfer Membership Rewards points to 18 airline and three hotel loyalty programs. Help from the Platinum Concierge. *Terms and limitations apply to all benefits. If you spend a lot of time in airports around the world, especially those with Centurion Lounges, then the lounge benefit makes it well worth having The Platinum Card® from American Express. With U.S. airports seeing passenger volumes rise nearly 45% to 1.8 billion since 2002, it helps to have space where you can relax or do work without being overcrowded. An individual Delta Sky Club lounge membership alone costs $545 a year, which practically covers The Platinum Card® from American Express’s $550 annual fee. There’s also access to Priority Pass Select (valued at $429 a year), along with Escape Lounges ($40 per visit) and Airspace Lounge (starting at $20 per visit). The Platinum Card® from American Express also comes with plenty of other travel-related perks that make it worth your consideration. What happened to the United Select Visa credit card?